Home » PHYTOCHEMICAL AND ANTIMICROBIAL POTENTIAL OF SEED AND BARK EXTRACTS OF SWIETENIA MAHAGONI (L.) JACQ. PHYTOCHEMICAL AND ANTIMICROBIAL POTENTIAL OF SEED AND BARK EXTRACTS OF SWIETENIA MAHAGONI (L.) JACQ. Department of Costume Design and Fashion 1, PG and Research Department of Microbiology 3, PSG College of Arts and Science, Coimbatore - 641014, Tamil Nadu, India. Department of Textiles and Apparel Design 2, Bharathiar University, Coimbatore - 641046, Tamil Nadu, India. ABSTRACT: Swietenia mahagoni (L.) Jacq. belongs to the Meliaceae family and it is native to the West Indies. It was introduced to India in 1975 and now grown in any parts of India. Biological activities of the plant are due to the abundance of phenolic compounds including different terpenoids and limonoids. The plant possesses various secondary metabolites which are responsible for its anti-bacterial, anti-fungal, anti-malarial, anti-diabetic anti-oxidant, anti-ulcer, anti-viral, anti-diarrhoeal, anti-pyretic and anti-inflammatory properties. This antimicrobial activity encouraged to work on identification of phytochemical and antimicrobial investigation of this herbal plant. The seeds and barks of Swietenia mahagoni is subjected to phytochemical screening for secondary metabolites and disk diffusion method for its antimicrobial activity against standard MTCC strains, two bacteria namely Staphylococcus aureus (gram+) (MTCC no. 6908), Escherichia coli (gram-) (MTCC no. 77) and one fungus Aspergillus niger (MTCC No.1344) were used for the study. The qualitative phytochemical tests reveal the presences of phytocompounds including alkaloids, terpenoids, tannins, and glycosides as major active constituents. The seed and bark extracts exhibit positively significant antimicrobial activity against the standard strains. The fungal activity was good in seed extracts, and bacterial activity was significant in bark extracts. INTRODUCTION: India has rich resources of herbal medicine to cure various ailments. Infectious diseases are the world leading cause of premature deaths and number one cause of deaths in tropical countries 1. Worldwide almost 57 million people die because of these Infectious diseases 2. Plants constitute major drugs to cure various human ailments. According to the World Health Organization (WHO), traditional medicines using plant extracts continue to provide health coverage for over 80% of the world’s population 3, 4. It is reported that 41% of medicine in the USA and 50% in Europe contain constituents from natural products which prove that the trend of using natural products is increased 1. Meliaceae plants are attracting considerable interest, because of their significant biological activities. Secondary metabolites like alkaloids, flavonoids, tannins, phenolic compounds, terpenoids, glycosides that hold various pharmacological properties are due to the presence of bioactive plant compounds 5. Biological activities of the plant are due to the abundance of phenolic compounds including different terpenoids and limonoids. The chemical entities of this plant have been proved for their anti-bacterial, anti-fungal, anti-malarial, anti-diabetic, anti-oxidant 6, anti-ulcer, anti-viral, anti-diarrhoeal, anti-pyretic and anti-inflammatory properties 7. Swietenia mahagoni (L.) Jacq. belongs to the family of Meliaceae 8, it is also called as West Indian Mahogany. It is extensively used as medicine for several diseases and widely grown plant of Indonesia 9. S. Mahogany (L.) Jacq. is a large, deciduous and economically important timber tree, it is mainly cultivated in the tropical zone, such as India, Malaysia and Southern China 10, 11. Mahogany can reach 75 feet in height 12, leaves are evergreen or semi-evergreen, flowers are unisexual, and the tree is monoecious 13. The leaves, fruits, bark, seeds and roots of S. mahagoni have been used traditionally for the treatment of hypertension, diabetes, malaria, amoebiasis, coughs, tuberculosis, antiseptic, astringent 14, diarrhea and tonic 15, 4, 16. S. mahagoni seeds are also reported to have medicinal value for the treatment of hypertension, diabetes, malaria, cancer, coughs, and intestinal parasitism; the stem bark decoctions are applied as antiseptic in cuts and wounds 11. Furthermore, the seed extracts S. mahagoni have been accounted to possess antimicrobial activity 17 and used for leishmaniasis and abortion medicine by an Amazonian Bolivian ethnic group and as a folk medicine in Indonesia 18. Seeds are used to cure diabetes, and also it possesses anti-inﬂammatory, anti-mutagenicity and anti-tumor activities 19. The seed oil is being used as an alternative body ointment therapy for a range of skin cuts, itches, and wounds to ameliorate the healing process in African countries. A decoction of bark is used to increase appetite 20. The bark serves as an antipyretic, bitter tonic and astringent 21. The bark decoction is extensively used as a febrifuge, which can be associated with its use as an anti-malarial drug 22. It is also evidenced that the aqueous extract of its seed and bark are used in local people of East Medinipur, (West Bengal), Balasore (Orissa) traditionally for curing psoriasis, diabetes and diarrhea 23. This tree yields perhaps the most famous timber in the world and is largely used for furniture and decorative articles 24. It has now become very rare due to overharvesting of the plant Swietenia mahagoni (L.) Jacq. and it is substituted by S. macrophylla king 24, 25. S. macrophylla king differs in its leaves, leaflets and fruits 26. Considering the above evidence, the study was planned to identify the Phytocompounds of the Swietenia mahagoni (L.) Jacq. seed and bark extract responsible for their antimicrobial property. Plant Materials: The plant specimen Swietenia mahagoni (L.) Jacq. barks were collected locally in Mettupalayam forest area, Tamil Nadu, India. The collected specimen was authenticated by Government of India Ministry of Environment, Forest and Climate Change, Botanical Survey of India, Southern Regional Centre, T.N.A.U campus, Coimbatore, India (Accession no. BSI/SRC/ 5/23/2017/Tech-565) and the sample specimen was kept in the herbarium library. The seed of the plant was purchased from the Forest Genetic Zone, Coimbatore, Government of Tamil Nadu in April 2018. Preparation of Plant Materials: The S. mahagoni plant bark was stripped from trunk and seeds were removed from its seed coat. The collected bark and seed were chipped and dried under shade for four weeks at room temperature to remove the excess moisture. The dried samples were powdered in an herbal grinding mill. Preparation of Plant Extracts: The extracts were prepared from nine solvents according to its polarity from low to high. The solvents used for the extraction are petroleum ether, benzene, n-hexane, chloroform, ethyl acetate, acetone, ethanol, methanol and aqueous. The seed and bark samples measuring 10 grams were added to 100 ml of solvent and kept in a shaker for 24 h. The samples are filtered using Whatman no. 1 filter paper and the filtrates were used for further analysis. Phytochemical Qualitative Analysis: The plant extracts were assessed for the existence of the phytochemical analysis by using the following standard methods. The extracts of S. mahagoni seed and bark were subjected to preliminary qualitative screening of various Phytoconstituents such as alkaloids, flavonoids, phenols, phloba-tannins, Saponin, tannins, terpenoids and glycosides which determine the major secondary metabolites in these as shown in Table 1. Wagner’s Reagent: It is the general reagent for deduction of alkaloids. 1.27 g of iodine and 2 g of potassium iodide was dissolved in 5ml of distilled water, and the volume was made 100 ml with distilled water. 2 ml of prepared extract and few drops of Wagner’s reagent forms reddish brown precipitate indicate the presence of alkaloids 27. Mayer’s Reagent: 2 ml of prepared extract and few drops of Mayer’s reagent forms white or pale yellow color indicate the presence of alkaloids 28. Test for Flavonoids: 2 ml extract was mixed with zinc dust and concentrated HCl was added dropwise. Formation of reddish pink to brown color indicates the presence of flavonoids 29. Test for Phenols: 2 ml of extract was mixed with 2ml of 2% solution of Fecl3. Formation of blue-green color precipitate indicates the presence of phenols 29. Test for Phlobatannins: (Precipitate Test) 2 ml of prepared extract was mixed with 2ml of hydrochloric acid (1%) and heated. Formation of red precipitate indicates the presence of phlobatannins 30. Test for Saponin: (Foam Test) 5 ml of extract was diluted with 5 ml of distilled water, and a drop of sodium hypo chloride was added to the solution and shaken well. Formation of froth indicates the presence of saponin 31. Test for Tannins: (Ferric chloride test) Distilled water and extract was taken in 1:4 ratios and 10% solution of ferric chloride is added dropwise, and few drops of dilute H2SO4 was added. The solution turns to a yellow or green color indicates the presence of tannin. Test for Terpenoids: (Salkowski’s test) Extract was mixed with 2 ml of chloroform, and 2 ml of concentrated H2SO4 was added carefully and shaken gently. A deep red color indicates the presence of terpenoids 17, 32. Test for Glycosides: (Keller-Kiliani Test) 2ml extract was mixed with 2 ml of glacial acetic acid containing 2 drops of 2% of Fecl3. The mixture was poured into another test tube containing 2 ml of concentrated sulphuric acid. A brown ring at the interphase indicates the presence of glycosides 33, 34. 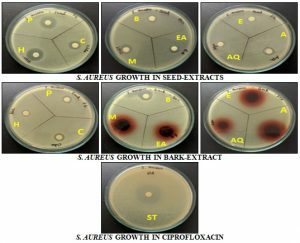 Evaluation of Antimicrobial Activity: The bark and seed extract were subjected to antimicrobial assays by disc diffusion test (Kirby-Baurer) technique. Microorganisms: In the present study, two bacteria namely Staphylococcus aureus (gram+) (MTCC no. 6908), Escherichia coli (gram-) (MTCC no. 77) and one fungus Aspergillus niger (MTCC no. 1344) were used for the study. The test microbes were collected from Microbial type culture collection & gene Bank (MTCC), CSIR- Institute of Microbial Technology, Chandigarh, India. Plant Extract Preparation: The seed and bark crude extracts of Swietenia mahogany were dissolved in dimethyl sulfoxide (DMSO) to prepare the dilute solutions. For one gram of extract (dry extract), 10ml DMSO is added to prepare the solution and stored in the refrigerator. Finally, these seed and bark samples were stored and labeled, and the labeled specimens were further taken for antimicrobial activities bioassay 22. Determination of Antibacterial Activity: The disk diffusion (Kirby-Baurer) technique, which is of the recommended standards of the National Committee for Clinical Laboratory Standards (NCCLS), was used for antimicrobial test 10. Determination of antibacterial activity was tested against crude extracts of nine solvents (from low to high polarity) namely Pet-ether, Benzene, n-Hexane, Chloroform, Ethyl Acetate, Acetone, Ethanol, Methanol, Aqueous extracts of seed and bark of Swietenia mahogany by the disc diffusion method. Nutrient agar medium was prepared and the standard MTCC bacterial strains 36 were spread by streaking the sterile swab all over the surface of the medium 3 times by rotating the plate through an angle of 60º after each application. Finally, pass the swab around the edge of the agar surface. Leave the inoculums to dry at room temperature with the lid closed. The standard sterile disc - SDO67 measuring 8 mm diameter (discs are soaked overnight in crude solvent extracts) were used to load the plant sample. Each sterile plate were divided into three parts, in each part samples disc such as for bark and seed were named by its crude solvent extracts i.e., Pet ether, n-Hexane, Benzene, Chloroform, Ethyl acetate, Acetone, Ethanol, Methanol, Aqueous were loaded with 100 μg/disc and placed on the agar plates inoculated with respective microorganisms. Further, the plates were placed at room temperature for 1 h to allow diffusion of extract into the agar 37. Then the plates were incubated for 24 h at 37 °C temperature. Ciprofloxacin 10 μg/disc was used as positive control. The antibacterial activity was evaluated by measuring the diameter of the inhibition zone around the sample disc after 24 h 38; the zone values were recorded in mm Table 2. Determination of Antifungal Activity: Sabouraud’s Dextrose Broth was prepared and the standard MTCC fungal strain Aspergillus niger was spread over the plate. Leave the inoculums to dry at room temperature with the lid closed. The standard sterile disc - SDO67 (discs are soaked overnight in crude solvent extracts) were used to load the plant sample. Each sterile plate was divided into three parts and named according to its solvent extracts were loaded with 100 μg/disc and placed on the dextrose plates inoculated with Aspergillus niger. Further, the plates were placed at room temperature for 1 h to allow diffusion of extract into the Dextrose Broth. Then the plates were incubated for 24-72 h at 28 °C temperature. Fluconazole 10 μg/disc was used as positive control. The antifungal activity was evaluated by measuring diameter of the inhibition zone around the sample disc after 72 h, and the zone values were recorded in mm. Phytochemical Screening: The qualitative analyses of chemical constituents of nine crude extracts of S. mahagoni bark and seed have been analyzed in this study. These tests reveal the presence of various bioactive secondary metabolites which might be responsible for their medicinal attributes. The observations and inferences made in the phytochemical tests are presented in Table 1. The biological activities of the plant are due to the presence of various plant secondary metabolites which contribute significant properties like anti-bacterial, anti-fungal, anti-malarial, anti-diabetic anti-oxidant, anti-ulcer, anti-viral, anti-diarrhoeal, anti-pyretic and anti-inflammatory activities. The plant of Meliaceae family are known to produce active secondary metabolites (limonoids; modified triterpenes) which have been reported to possess a wide range of activities including antimalarial, cytotoxicity against cell lines 39; terpenoids are also known to possess antibacterial, antifungal activities 1. Biological activities of the plant are due to the presence of phenolic compounds which includes different terpenoids and limonoids 7. The significant pharmacological activities like anti-bacterial, anti-malarial, anti-viral, anti-cancer and anti-inflammatory activities are due to the presence of terpenoids, phlobatannins are responsible for the wound healing, i.e., anti-inflammatory property in cuts and wounds 40. Antimicrobial activities against pathogens are due to the presence of alkaloids,, saponin, tannins, and flavonoids in medicithe nal plants 28. Glycosides also have vast therapeutic efficacy as they are found in almost every medicinal plant. The studies have confirmed that saponin possesses the unique property of precipitating and coagulating red blood cells 31. The test result reveals that significantly positive results for the presence of alkaloids, tannins, terpenoids, and glycosides for all the seed and bark extracts. From the result, it shows considerably high terpenoids content found in both the seed and bark extracts. The ethyl acetate, acetone, ethanol, methanol and aqueous extracts of the bark shows potentially +ve results for the presence of phytocompounds, among other extracts acetone bark extract, shows a high level of phyto-compounds for the majority of test methods. So it is concluded that, phytochemical screening Swietenia mahagoni (L.) Jacq. seed and bark extract reveal the presence of maximum classes of phytoconstituents in bark extract when compared to seed. Evaluation of Antimicrobial Activity: The antimicrobial activity of crude extracts of Swietenia mahagoni (L.) Jacq. seed and bark are shown in Table 2, Fig. I, II, III were evaluated in-vitro using disk diffusion method. 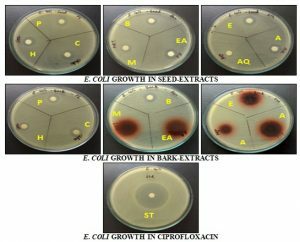 Evaluation of Antimicrobial Activity of Seed Extract: The S. mahagoni seed revealed that pet ether extract shows strong antibacterial activity for Staphylococcus aureus with the maximum zone of 20 mm. The n-hexane seed extract shows a maximum of 17 mm zone against Escherichia coli when compared other solvent extracts. In the fungal test, it is found that n-hexane and chloroform extract shows the good result of 11 mm zone against Aspergillus niger. So, it could be concluded that among all the seed extracts n-hexane shows comparatively better results both for bacterial and fungal activity. 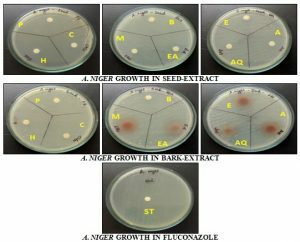 Evaluation of Antimicrobial Activity Bark Extract: The results of S. mahagoni bark shows positive activity for almost all the solvent extracts against Staphylococcus aureus and Escherichia coli bacteria and shows minimum zone for the fungal test against Aspergillus niger in few bark extracts. CONCLUSION: Hence, the study could be concluded that, in the qualitative phytochemical screening of different solvent extracts of Swietenia mahagoni (L.) Jacq. reveal the presence of various compounds. The acetone bark extract shows more efficient results where most of the said phytochemical were present. 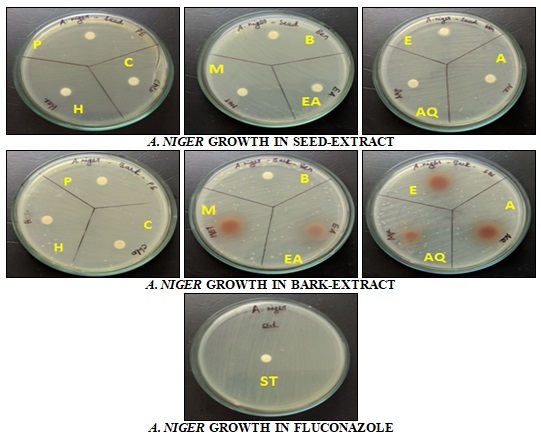 The S. mahagoni seed and bark were analyzed for its antibacterial activity by disk diffusion test, and results were observed to be potential for selected strains. The bacterial and fungal activity of seed shows notable zone against bacteria and fungi in n-hexane extract. 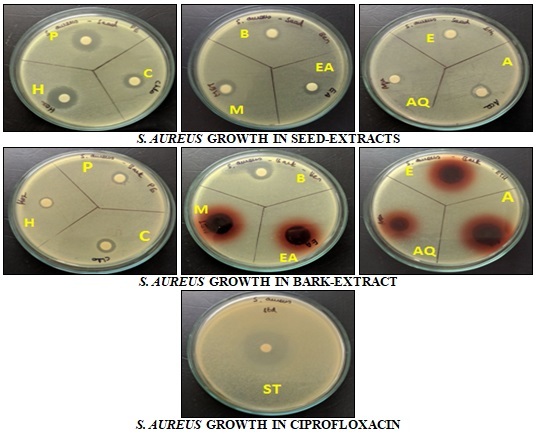 The crude acetone extract of S. mahagoni bark reveals positive results for both the test bacteria (Staphylococcus aureus and Escherichia coli). Overall, the results of S. mahagoni bark extracts shows potentially positive results when compared to the seed extracts. Thus the results of the study agreement with the results of previous work of the plant 10, 18, 12. ACKNOWLEDGEMENT: The authors are highly thankful to PG & Research department of microbiology, Textile microbiology laboratory, PSG College of Arts and Science, Coimbatore, Tamil Nadu for providing all the necessary facilities to carry out this work. Paritala V, Chiruvella KK, Thammineni C, Ghanta RG and Mohammed A: Phytochemical and antibacterial potential of mahogany family. Brazilian Journal of Pharmacognosy 2015; 25: 61-83. Akhtar N, Ihsan-ul-Haq and Mirza B: Phytochemical analysis and comprehensive evaluation of antimicrobial and antioxidant properties of 61 medicinal plant species. Arabian Journal of Chemistry 2015; 1-13. Rahman SMA, Akter M, Hira TE, Mian MDY, Ahmed I and Rahman MM: Antioxidant and antimicrobial activities of flower and bark extract of Swietenia mahagoni (L.) Jacq. Journal of Pharmacognosy and Phytochemistry 2014; 2: 185-188. Amarasuriyan C, Raju K and Raja A: Phyto-chemical studies and in-vitro free radical scavenging activity of Swietenia mahagoni (L.) Jacq. Indian Journal of Natural Sciences 2014; 4: 1513-1519. Ravishankar B, Mahmood R, Krishna V, Kumar NMV and Shastri SL: Phytochemical screening and antibacterial activity of Chloroxylon swietenia International Journal of Pharma Research and Health Sciences 2017; 5: 2002-07. Jawi IM, Mahendra AN, Subawa AAN, Yasa IWPS and Gunawan IWG: Comparison of the antihypertensive and antioxidative effect of mahogany (Swietenia mahagoni (L.) Jacq.) seed extract and purple sweet potato (Ipomoea batatas) tuber extract on a rodent model of hypertension. Biomedical & Pharmacology Journal 2017; 10: 577-582. Divya K, Pradeep HR, Kumar KK, Venkatesh KRH and Jyothi T: Herbal drug Swietenia mahogany jacq- a review. Global Journal of Research on Medicinal Plants & Indigenous Medicine 2012; 1: 557. Sahgal G, Ramanathan S, Mordi SS, MN, Ismail S and Mansor SM: Phytochemical and antimicrobial activity of Swietenia mahagoni crude methanolic seed extract. Tropical Biomedicine 2009; 26: 274-279. Yu-Yu C, Xiao-Ning W, Cheng-Qi F, Sheng Y and Jian-Min Y: Swiemahogins A and B, two novel limonoids from Swietenia mahogany. Tetrahedron Letters 2007; 48: 7480-7484. Waziiroh E, Harijono and Kamilia K: Microwave-assisted extraction (MAE) of bioactive saponin from mahogany seed (Swietenia mahogany Jacq). International Conference on Green Agro-industry and Bioeconomy IOP Conf. Series. Earth and Environmental Science 2018, 1-8. Bhurat MR, Bavaskar SR, Agrawal AD and Bagad YM: Swietenia mahagoni A Phytopharmacological Review. Asian Journal of Pharmaceutical Research 2011; 1: 1-4. Sangeetha K and Yasotha P: Development of cotton and cotton gauze fabric coated with Swietenia microphylla bark as a wound contact layer. Research and Reviews: Journal of Toxicology 2014; 4: 1-4. Sundar DS, Anandan S and Namasivayam SKR: Antifungal activity of Swietenia mahogany on Candida albicans and Cryptococcus neoformans. Journal of Microbiology and Anti-Microbial 2013; 5: 55-59. Ervina M and Sukardiman: A review: Melia azedarach L. as a potent anticancer drug. Journal of Pharmacognosy 2018; 12(23): 94-102. Darussalam H, Nuryastuti T and Mustofa M: Antimicrobial activity of bioactive compounds isolated from Swietenia mahagoni (L) Jacq. against Staphylococcus aureus and Pseudomonas aeruginosa. Journal of Medical Science 2014; 46: 161-166. Haqu M, Ullah MO and Nahar K: In-vitro antibacterial activity of different parts of plants Swietenia mahagony. Pakistan Journal of Biological Sciences 2009; 12: 599-602. Debasis D, Chatterjee K, Ali KM, Bera TK and Ghosh D: Antidiabetic potentiality of the aqueous-methanolic extract of seed of Swietenia mahagoni (L.) Jacq. in streptozotocin-induced diabetic male albino rat: A correlative and evidence-based approach with antioxidative and antihyperlipidemic activities. Hindawi Publishing Corporation Evidence-Based Complementary and Alternative Medicine 2011; 1-12. Naveen YP and Urooj A: Phytochemical, proximite composition and antioxidant potential of Swietenia Mahagoni Asian Journal of Pharmaceutical Research 2015; 5: 161-166. Sanyal M and Datta PC: Pharmacognosy of Swietenia mahogany bark drug. The Ancient Science of Life 1986; 5: 172-181. Durai MV, Balamuniappan G and Geetha S: Phytochemical screening and antibacterial activity of leaf, seed and central-fruit - axis crude extract of Swietenia macrophylla king. Journal of Pharmacognosy and Phytochemistry 2016; 5: 181-186. Haldar PK, Adhikari S, Bera S, Bhattacharya S, Panda SP and Kandar CC: Hepatoprotective efficacy of Swietenia mahagoni Jacq. (Meliaceae) bark against paracetamol-induced hepatic damage in rats. Indian Journal of Pharmaceutical Education and Research 2011; 45: 108-113. Mousa OM, Moustafa MY, El Askary HI and El-zalabani SM: Leaf volatiles of stem bark exudates of two Swietenia species. Composition and Bioactivity 2014; 3: 3704-3722. Falah S, Suzuki T and katayama T: Chemical constituents from Swietenia macrophylla bark and their antioxidant activity. Pakistan Journal of Biological Sciences 2008; 11: 2007-2012. Bacsal K, Chavez L, Espina S, Javillo J, Manazanilla, Motalban H, Panganiban C, Rodriguez A, Sumpaico C, Talip B and Yap S: The effect of Swietenia mahogany (mahogany) seed extract on indomethacin- Induced Gastric Ulcers IN Female Sprangue Dawley Rats. Acta Medical Philippina. Banu KS and Cathrine L: General techniques involved in phytochemical International Journal of Advanced Research in Chemical Science (IJARCS) 2015; 2: 25-32. Sheel R, Nisha K and Kumar J: Preliminary phytochemical screening of methanolic extract of Clerodendron infortunatum. ISRO Journal of Applied Chemistry 2014; 7: 10-13. Teli M D, Pandit P and Jangle A: Antibacterial property of Sterculia foetida fruit shells. Asian dyer 2015: 41-44. Yadav M, Chatterji S, Gupta SK and Watal G: Preliminary phytochemical screening of six medicinal plants used in traditional medicine. International Journal of Pharmacy and Pharmaceutical Sciences 2014; 6: 539-54. Yadav RNS and Agarwala M: Phytochemical analysis of some medicinal plants. Journal of Phytology 2011; 3: 10-14. Dhakad PK: Phytochemical investigation and anti-diarrheal activity of hydroalcoholic extract of fruits of Citrullus colocynthis (L.) Schrad. (Cucurbitaceae). Journal of Molecular and Genetic Medicine 2017; 11: 1-6. Gul R, Jan SU, Faridullah S, Sherani S and Jahan N: Preliminary phytochemical screening, quantitative analysis of alkaloids, and antioxidant activity of crude plant extracts from Ephedra intermedia indigenous to Balochistan. The Scientific World Journal 2017; Article ID 5873648: 1-7. Manikandan A , Rajendran R, Abirami M and Kongarasi K: Antimicrobial activity and phytochemical analysis of Impatiens balsamina Seed (Kaci-T-Tumpai) collected from Coimbatore District, Tamil Nadu, India. International Journal of Pharmaceutical Sciences and Research 2016; 7: 5039-5043. Vennila S and Brindha D: Antimicrobial activities of hydroethanolic extract of Morinda citrifolia International Journal of Current Microbiolgy and Applied Science 2014; 3: 26-33. Pachiyappan KM, Sampath VR and Kumar SB: Comparative study of antimicrobial activity of quaternary ammonium component coated knitted fabrics. Asian Journal of Microbiology, Biotechnology & Environmental Sciences 2013; 15: 739-742. 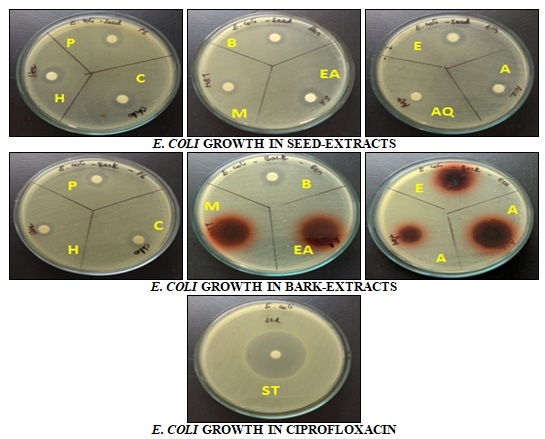 Manikandan A , Rajendran R, Balachandar S, Sanumol MS and Sweety MM: Antimicrobial activity of Ailanthus excelsa Collected from Coimbatore District, Tamil Nadu, India. World Journal of Pharmacy and Pharmaceutical Sciences 2015; 4: 697-704. Pragadheeswari R and Sangeetha K: Herbal coated natural nonwovens for the development of foot insoles with reference to a diabetic foot ulcer. International Journal for Research in Applied Science & Engineering Technology 2017; 5: 2905-2914. Abdelgaleli SAM, Deo M and Nakatani M: Phytochemistry, ring B, D –Seco limonoids antifeedants from mahogany. Phytochemistry 2013; 96: 312-317. Wadood A, Ghufarn M, Jamal SB, Naeem M, Khan A, Ghaffar R and Asnad: Phytochemical analysis of medicinal plants occurring in the local area of Mardan. Biochemistry & Analytical Biochemistry 2013; 2: 1-4. Yasotha P, Sangeetha K and Rajendran R: Phytochemical and antimicrobial potential of seed and bark extracts of Swietenia mahagoni (L.) Jacq. Int J Pharm Sci & Res 2019; 10(2): 712-20. doi: 10.13040/IJPSR.0975-8232.10(2).712-20. Authors Address: Department of Costume Design and Fashion, PSG College of Arts and Science, Coimbatore, Tamil Nadu, India.